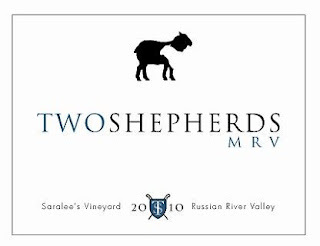 Two Shepherds wines are a creation of William Allen, publisher of the Simple Hedonisms wine blog, among other things. In the first part of this two-part blog series, I interviewed William via email to get inside the bottle, so to speak. He explained his motivation, goals, and told us about the great support he got from friends and winemakers around California. For this second blog entry, I am posting my tasting notes on each of the wines I purchased from William. 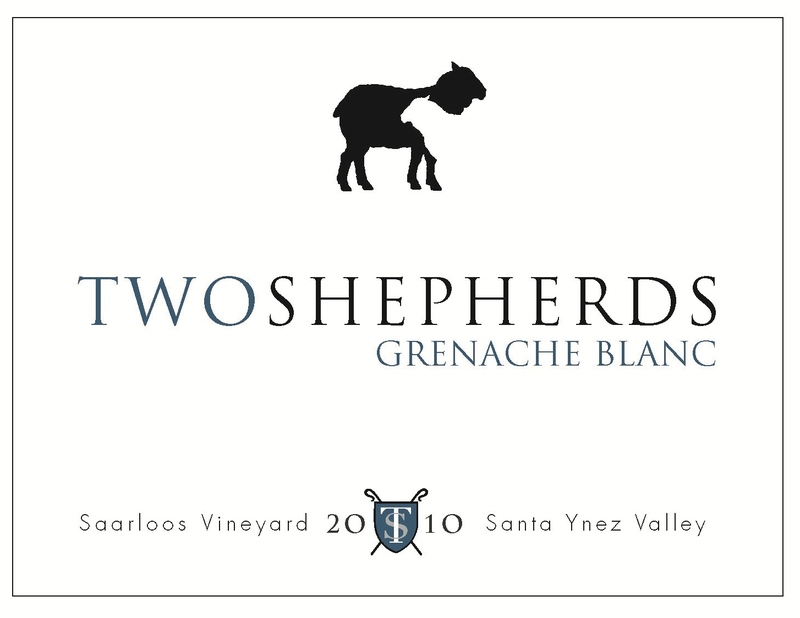 2010 Two Shepherds Grenache Blanc Saarloos Vineyard: Nose of Asian spice, kiwi fruit, limestone, lemon zest, and pear. At room temperature I detected a little heat from the alcohol but it's not too distracting. Good intensity and a complex set of flavors create an expressive, vibrant bouquet. The palate opens with a burst of lively acid that gives way to a balanced mid-palate of ruby grapefruit, tangerine, limestone, and peppery spice. Great flavor integration that will only get better with time had me thinking this wine will last 5-7 years. More heat comes through on the finish but it's something that will go away when this grenache blanc is chilled. This is an impressive effort, well worth the $24 per bottle. I would suggest pairings of grilled chicken, fish & chips, and even pasta with cream sauce. 13.9% abv. 2010 Two Shepherds Viognier Russian River Valley: Beautiful nose of apricot blossom, yellow peach, and a touch of sweet cream. I was impressed with the aromas because they weren't too overly sweet, instead being in perfect harmony. The mouthfeel is rich and beautifully smooth, yet with some focused acidity to create a nice framework for the grapefruit, pear, yellow peach, and wet river rock. A lingering finish with hints of pine sap and grapefruit tapers off gently after almost 20 seconds. This is one to buy a full case of, it will get better and better with each passing year. As someone who frequently finds California viogniers too sweet and lacking structure, the Two Shepherds is a shift away from that, to a Condrieu-style expression. Pair with chicken tetrazzini, Indian cuisine, or even a simple chicken salad. $21. 13.78% abv. 2010 Two Shepherds MRV Saralee's Vineyard: A white Rhone-style blend of 47% marsanne, 47% roussanne, and 6% viognier. The bouquet is all mint leaf, sea air, hints of peach, and star fruit. Secondary aromas of golden apple and asian pear create a lively sensory experience. Impressive for such a young wine, I think this could pass for a white Cotes du Rhone in a blind tasting. The palate is composed of nicely integrated mint leaf, apple, English toffee, and pear notes. I really enjoyed the mineral character, which gave this white blend a round texture without being flabby. The flavors combine to build a nice crescendo before slowly tapering off to an elegant finish. Out of the three Two Shepherds white wines, this screams at me that it needs food. Pair with lobster or herbed chicken, a cheese plate, or grilled whitefish. $24 per bottle. 14.2% abv. 2010 Two Shepherds GSM California: A blend of 50% grenache, 25% syrah, and 25% mourvedre. The grenache and syrah are from Sonoma County and the mourvedre is from Alameda County. After being open for a few minutes, aromas of raspberry, strawberry, dried herb, and cola waft out of your glass. This is young but showing nice integration even at this point. Secondary aromas of cracked pepper and good minerality build an impressive background to support the red fruit. Upon tasting, you will notice the acid in this GSM is young and a touch raw, but is also the type to hold this wine together for several years. Right now it needs food, cheese and meat especially. Spicy raspberry and wild strawberry, cracked black peppercorn, tobacco, and just a touch of oak that ends the beautifully tapering finish. Although the palate is a bit disjointed, you get the sense of a dominant syrah right now, that's something that will evolve out. That said, the spice and pepper notes carry this wine beautifully. I'm going to be buying more. 13.8% abv. $32 per bottle. Now before you accuse me of bias and all manner of unsavory things (most of which are probably true), I will state that these wines aren't perfect. That's a double edged sword though, because to be too perfect would rob William's wines of their garagiste-winemaker charm. If each of these wines was flawless, they would be a little less interesting. It's critical to keep in mind that these are Two Shepherds inaugural releases, and they all need some time to settle down. My biggest gripe ($5 to the person who already guessed it!) is the relatively high alcohol on the Grenache Bland and the MRV. If I were to nitpick, I would also suggest that some of the more angular acidic edges could be refined, but that would be more to please the critics than my own palate. Bring on the angles, and just say no to flabby, boring white wine. 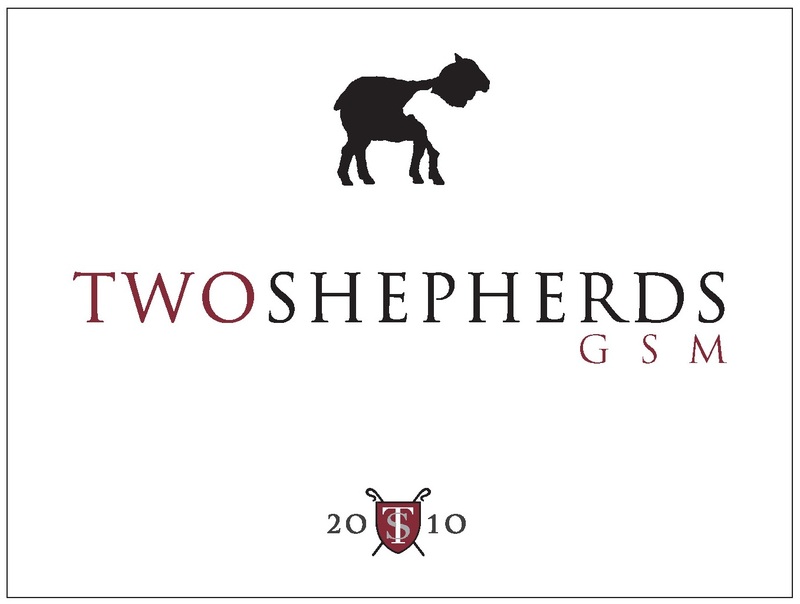 The same goes for the Two Shepherds GSM, which will evolve beautifully over the next few years. I must note that it isn't quite available yet for the general public, but you'd best email William about any quantity you may desire, and email quickly. After tasting through this lineup, I was pleased that they were all so good. My tasting partners agreed, and while they had some suggestions for improvements as well, our unanimous sentiment was that they were all very drinkable, high quality. For that, I raise a glass to William Allen and his Two Shepherds wines. It's great when a wine blogger starts making wine, and even better when the wines are delicious! Many thanks for the time spent on this post & review Beau, and your insightful comments. Since I am about to take off to France, thought I'd add a few things. First, I'd never refute anyone's tasting notes, and I have always found you have a good palate. Each of us has a completely different set of sensory tools, and no two of us taste wine the same. I think you are blessed with sharp sensory skills. On the Grenache Blanc - I agree it can taste a tiny bit hot at room temp, but I'd suggest its from the high acidity, native to the varietal, whose edges I did my best to tame via neutral oak, lees contact, and ML. Domestic Grenache Blanc under 14% alc is a bit rare. Its also impossible to find right now in cool climate, although I continue to seek it out. I agree on the aging, but with 6 cases left :( unless I freeze sales (I have actually declined 2 retail placements) I may never know! I agree that this, and actually the MRV, are best at ~56-58 degrees. It softens the high pH/TA and compliments the inherent mouth feel there by design. Glad you love the Viognier - its confused many, which is why I call it the non CA Viognier. I am actually debating changing the 2011 style, barrel program, will reconsider. I only wish I had two full barrels this year. Hmmm. MRV - our most popular, complex wine for sure. I think it begs for food to compliment it indeed, but because its complex, more than lacking with out. I'd again say 14.2 isn't high alcohol, but I think this year, if the blend remains the same, it will be be a bit lower, simply because we had such a brutal summer in RRV and it barely ripened, but is gorgeous at 20-22 brix. The only way to lower the acid is to (a) de-acidify, which I try not to monkey with acid adds or additions. (b) pick it riper which means lower acid but raise alcohol. (c) put it through Malolactic, which I indeed did on all whites, even though full ML on these varietals often isn't popular school of thought. I totally agree the wines aren't perfect - I think most winemakers spend their career chasing their best vintage, and I doubt I will be any different. One thing is for sure though, if it won't pass my own picky, high maintenance palate, it will never see a bottle. I will dump a barrel down a drain, before my name goes on a wine I wouldn't drink. I am super excited with this years 20 barrels (instead of 7) gives us. Its fun, scary, exciting, and damn hard work! Congrats also on your first vintage, I hope to be able to taste it when bottled! Have a great new year, and keep up the great writing - love your blog! William, thanks so much for taking the time to comment! It was fun tasting your wines and I am really happy at how they turned out. As you know, I enjoyed each one and will be placing another order soon! You can put me down for at least six bottles of the GSM too ;-)Have fun in France!